I continue to look for creative, innovative and unique ways to reinvent plastic. Quite honestly, this time I surprised even myself. Introducing my newest creation, Grow It - Wear It Recycled Plant Necklace. 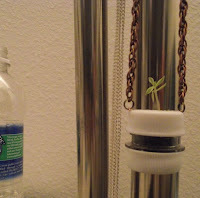 This micro-miniature little lovely was made from the neck of a water bottle. A second cap is used for the base which is secured on and there's absolutely no chance of it falling off. The top cap unscrews so you can make up the planter then screw it s back on. It is very light around your neck and is available in Cord or Chain. Please come back and visit soon as I will be introducing more micro-miniature plant pendants that are even more unique !!! Thanks for letting me share my newest product line with you !!! What a great idea. Best wishes for your new line. Very cool idea! check you out!